A completely customized review funnel for your business that automates the process of collecting third-party reviews from your raving fans. Think about the last time you made a purchase - did you look for reviews? Did you go with the company that seemed to have a lot of raving fans? If you're like most, you did. And yet, getting your happy customers to post reviews on Google, Facebook, Yelp, and other industry sites is hard - even if your customers love what you do. 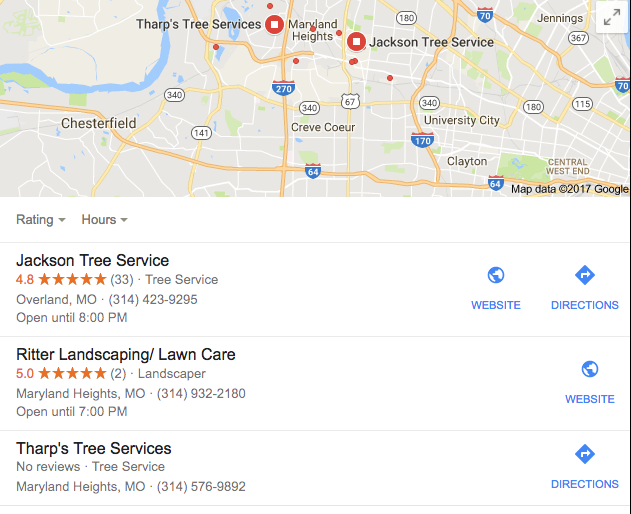 Which tree service do you think you would call first based on these reviews? Notice which is at the top? Which dentist do you think you would call first based on these reviews? Notice which is at the top? 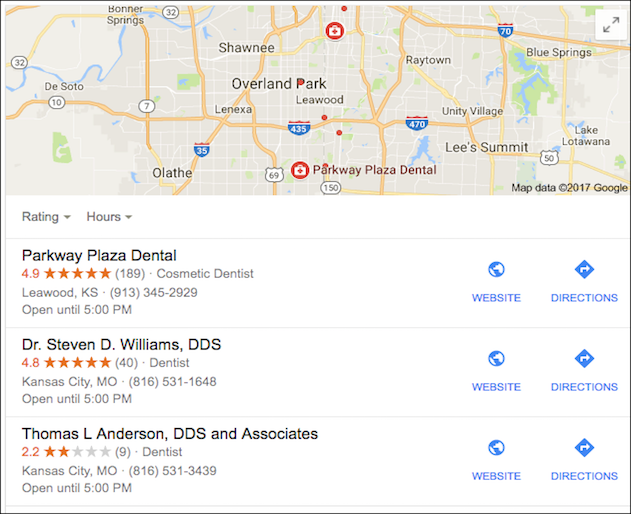 In the review game, it's a matter of quantity and quality - the more 5 star reviews you have the less impact an occasional negative review makes and Google favors local businesses with reviews. The review funnel – “funnels” your clients to the 3rd part sites like Google and Yelp where reviews are an important part of your online presence. "We knew our clients were happy, but getting them to write reviews was a pain. When we engaged the Duct Tape Marketing Review Funnel we were able to turn those happy customers into over 60 online reviews almost overnight. " Architexture Hair Salon in Kansas City had built a loyal and happy client base, but getting those happy clients to leave reviews proved challenging. When they had us build a review funnel and create a monthly review capture process they immediately turned those happy clients into happy review clients. In less than 60 days they had 60 solid reviews on sites like Google, Yelp, and Facebook. The five stars were a reflection of their good work, but we allowed them to amplify that good work in the form of a growing list of reviews. The chart above is a screenshot of a report we run for review funnel clients each month. The review funnel process is an ongoing automated review collection system. The fee for the service is $99/mo. This includes funnel set-up, integration with your website, and ongoing email outreach to client list each month. A 3-month commitment is required for the funnel, however, the best results are often achieved by gathering reviews long term over 6-9+ months. When reaching out to your clients, we take the first batch of clients, typically clients from the last year or so, and spread that mailing out over the first 30 days. After the first 30 days, we reach out to new clients as you submit them.If a client submits a review or even clicks on the email link and chooses not to leave a review, they will be removed from the funnel. If after we build your review funnel you don’t think you can use this tool to dramatically improve your online reviews results, simply ask for a full refund.